It ain’t over folks. So don’t break out your linen pants or sundresses, because old man/woman winter hasn’t exited stage left. There is more to come, dollars to donuts. Don’t put away your sweaters or your snow tires and for heaven’s sake would you stop looking at that seed catalog. When will we learn that we rush winter at our peril? Winter will leave when it’s good and ready. And before you think that a few daffodils blooming, mean that spring has sprung – well think again. You’ll be draping wee daffodil-sized coats on those daffy flowers when the cold snap comes back with a vengeance. Besides, winter is an excuse to savor comfort food. Something cooked nice and slow. Lots of spice and not a lettuce leaf in sight. Because all too soon, spring will show up for its day in the sun, and then summer will be here with all its heat and humidity and suddenly winter won’t look so bad after all. Mix the chile power, turmeric and cumin seeds together and rub over the pieces of pork. Place the pork in a bowl or re-sealable plastic bag and refrigerate for several hours or over night. Slice the onion into thick rings. Heat a frying pan, add a drizzle of oil and cook the onions on both sides until gently browned. Remove and set aside. Sprinkle the pork generously with salt, add more oil to the pan if needed, and cook the pork in batches, browning on all sides. Add the onions back into the pan. Peel the zest off the orange using a vegetable peeler and add to the pork and onion mixture. Juice the orange and add along with the chicken stock and the dried ancho chile, making sure the stem is removed. The liquid should almost cover the pork and onions. Place the liquid back in the pan, reduce until thickened slightly and add the pork and onions back in, along with the beans. Serve hot and garnish with chopped pistachios and cilantro, if you desire. Do remind me what you give for a first anniversary? Ah yes, of course paper – the ultimate romantic gift. To keep it practical, why not give a roll of paper towels or an old newspaper? The ‘modern’ option is a clock. Wow. Nothing says ‘I love you’ like a clock. Why all this chat about first anniversary gifts? Because reader, next month is the anniversary of the announcement of Mike Smith’s ‘discovery’. Yes, Mike Smith from Denbighshire in England. You remember Mike, don’t you? You don’t? Oh dear…Well let me refresh your memory. Mike from Denbighshire created the hottest chile ever recorded. It’s all coming back to you now, isn’t it? Mike wasn’t out to create something super hot – he was after a pretty plant for his Chelsea Flower Show display. But his ‘Dragon’s Breath’ chile scores 2.48 million on the Scoville heat index – beating the Carolina Reaper, that clocks in at a cool – pardon the pun – 2.2 million. Scientist figure that Dragon’s Breath is so hot that if you ate one you could go into anaphylactic shock. I’m going to trust them on this one. Here’s the thing – more heat isn’t always better. At the Chile Trail we’re all about heat but we’re also all about the food. If it’s too hot and you can’t taste anything then what’s the point? Take this cute as a bug salad we whipped up. It’s got mild chile molido in the dressing and a sprinkle of chile pequin on top. Is it hot? Yes. Can you make it hotter? Darn straight you can – just add some more or use our hot chile molido instead. But it’s not so hot that you lose the flavor of the pink grapefruit, avocado and feta cheese. So congrats Mike from Denbighshire. We’ll be sending over a congratulatory paper plate to celebrate. But the Dragon’s Breath chile? We’ll pass, but thanks anyway. To segment the grapefruit, take a thin slice off the top and bottom, so the grapefruit can sit on a chopping board. Take a sharp knife and slice off the skin and white pith by cutting along the curve of the grapefruit. Next, make v-shaped cuts to release the grapefruit segments. When you’re cutting the segments out, hold over a bowl so you can capture any juice. To make the dressing, mix the lime juice, chile molido and vegetable oil together, along with any grapefruit juice. Taste, add salt and a bit more oil if the dressing is too sour. Arrange the lettuce leaves on a platter. Top with the grapefruit segments, feta cheese and avocado. Garnish generously with the chile pequin and drizzle the dressing over the salad. Serve any extra vinaigrette on the side. 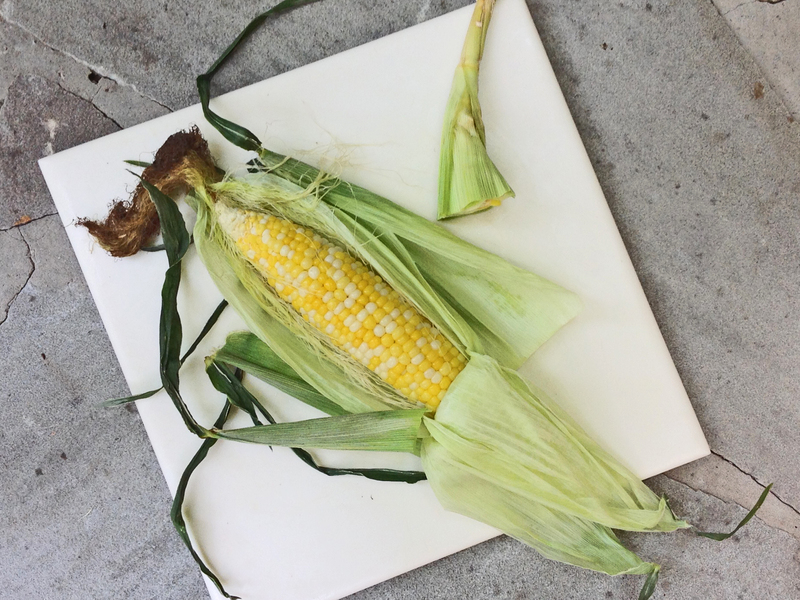 Corn – specifically corn-on-the-cob – is one of summer’s greatest gifts. 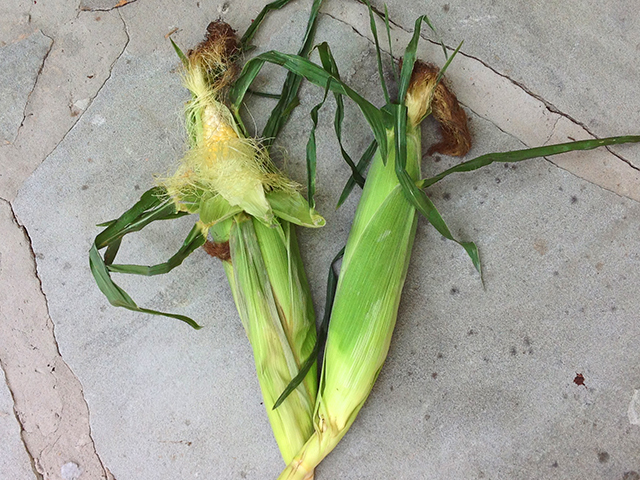 Only winning the lottery or finding my keys would make me happier than an ear of corn. I met a farmer who told me he loves the corn he grows so much that he eats it raw. Okay, so maybe I don’t love it that much. But then he went on to say that he microwaves his corn (when he’s not chowing down on an ear in the fields). Four minutes per ear and the husk and silks slide off effortlessly. So I tried it. And guess what? He’s right. You pop the corn (I’d do a max of two ears at a time) in the microwave as is – don’t peel it or anything. Set the timer for 4 minutes for one ear or 8 for two. Then stand back and watch that puppy twirl around. 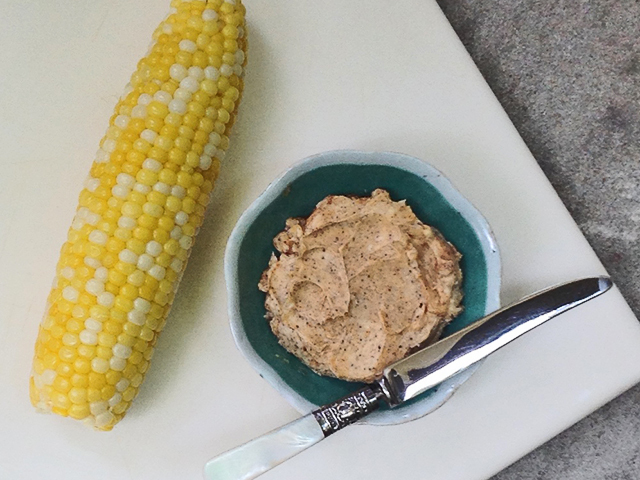 Or better yet, make a Chile Butter to go with your corn. Mix some softened butter (I figure about 1 tablespoon per ear) with some chile powder. I use Chile Molido (press here for the hot version!) but you can go for something hotter if you like. I add about ¼- ½ tsp for 4 tablespoons of butter. By the time you’ve finished mixing it your corn should be ready. Take it out of the microwave and slice off the bottom (stem end). Warning: it’s hot. Very hot. Then carefully pull off the husks and silks – they’ll slide off easily. It’s a piece of cake (or piece of corn), I promise. 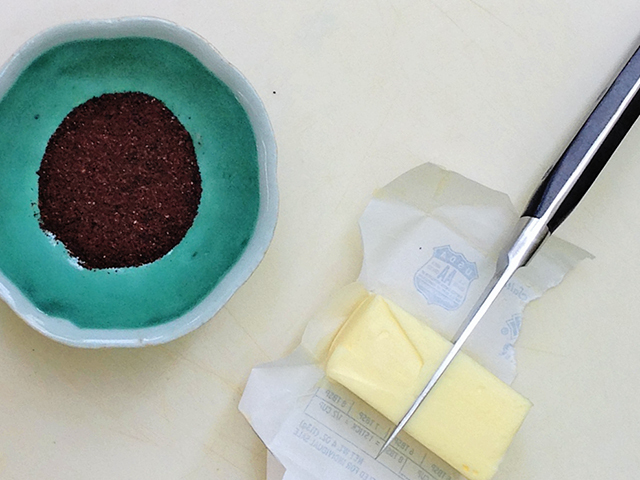 Slather on some chile butter and you’re good to go. Quick, easy and you’ve got a whole lot of summer lovin’. Do you remember that time last winter? You know…. when the snow was up to your armpits and you were sure spring would never come. 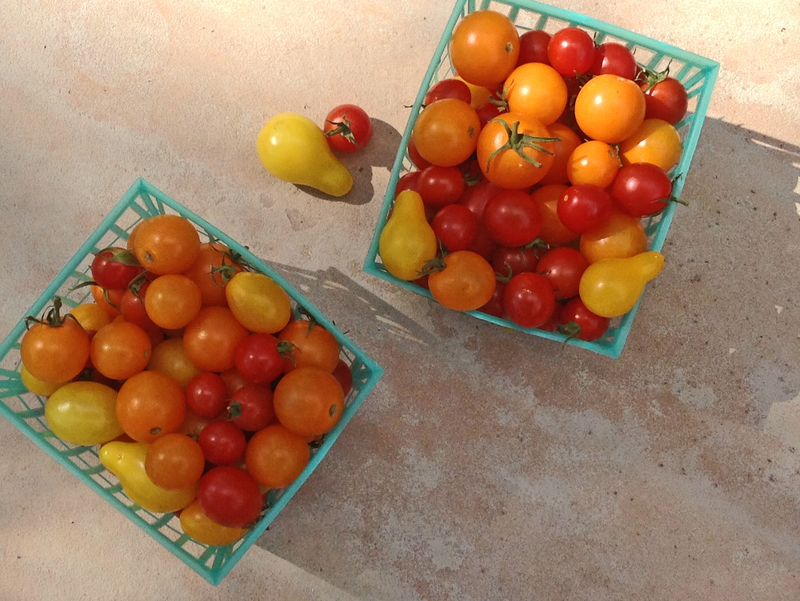 You walked into your local grocery store, staggered over to the veg department and there you saw it: a red tomato. It was a beacon saying, “Winter won’t last, I promise.” So you picked up that tomato and cradled it like a baby and went home. But guess what? You sliced that puppy up and it tasted like nothing. Absolutely nothing. Cuz tomatoes may look nice in winter but they don’t taste so hot. So here you are – it’s late summer and winter seems pretty far away. But it’s not. 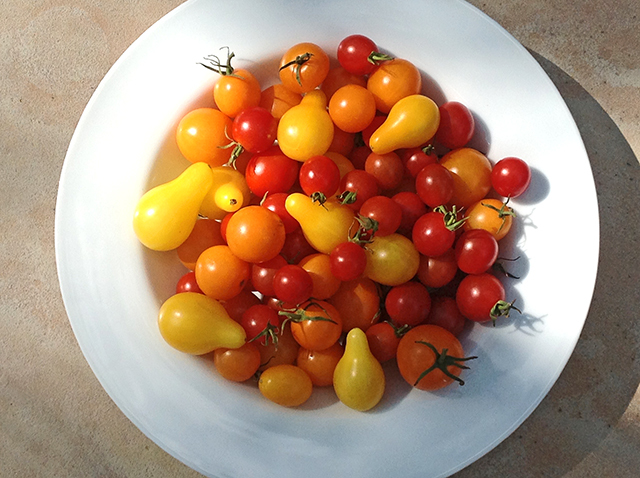 So now is the time to eat your fill of tomatoes. Eat them raw, cooked and anything in between. Eat them until you’re positive you can’t stomach another. Because sooner than you think, winter’s going to be back. So make some memories now that will last you a good long time. 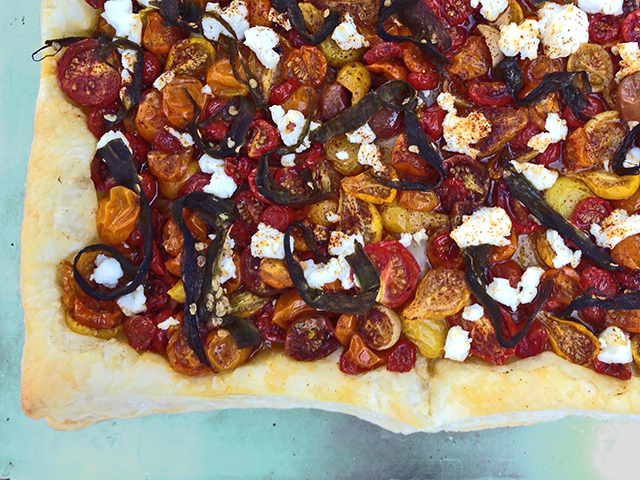 This Tomato tart is a great way to boost your tomato intake. We slow roast them in the oven so the flavor is super concentrated – they taste like candy only way better. We use a store bought pastry because life is short and who needs the hassle of making it? But we don’t go for the cheapo stuff – we like Dufour pastry. Why? Because it’s made with lots and lots and lots of butter. Need we say more? And we didn’t say this recipe was lo-cal, ok? Here’s another tip. 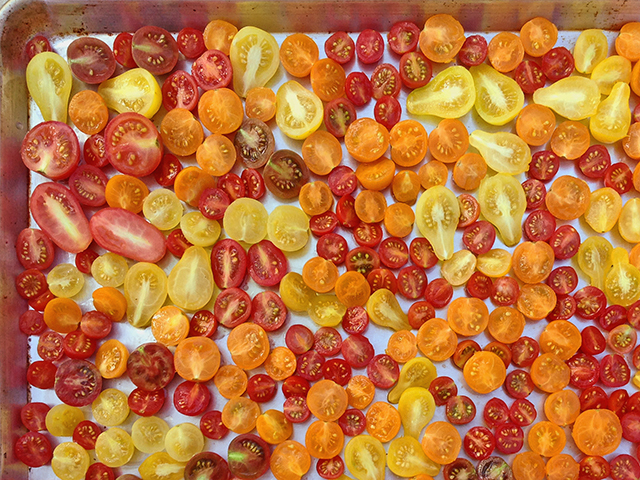 Make an extra batch or two of the tomatoes. Pop them in a plastic container and put them in the freezer. That should get you through this year’s winter. Preheat the oven to 220°. 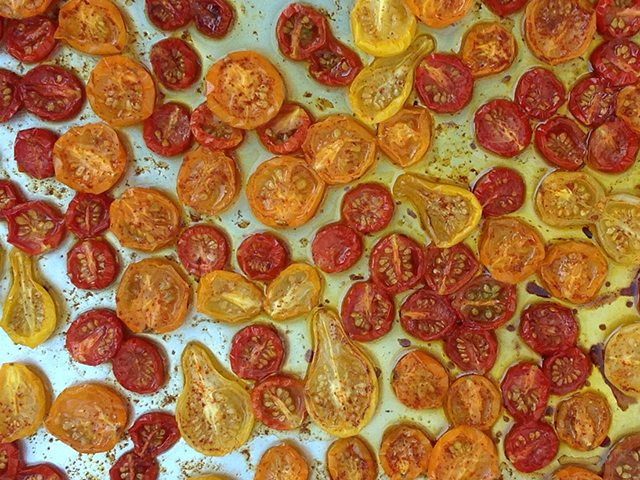 Slice the tomatoes in half and place them on a baking sheet, cut side up. Drizzle with the olive oil and sprinkle the salt and chile molido over the top. 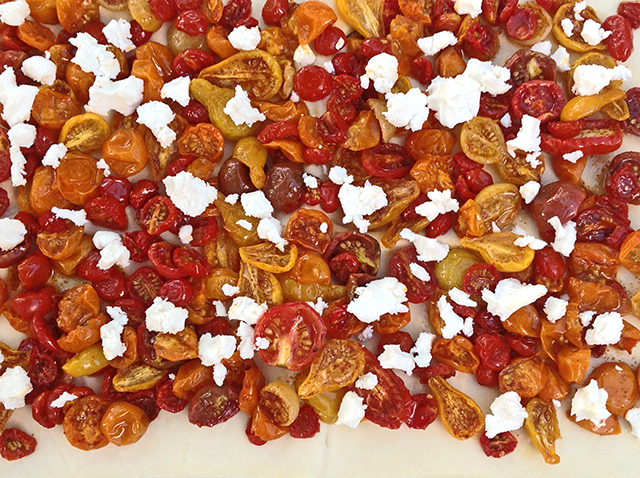 Place the tomatoes in the oven and cook for 1 ½-2 hours until the tomatoes have lost their moisture. They should be soft and slightly chewy. Remove from the oven. Increase the oven temperature to 425°. Place the puff pastry on another baking sheet. Place the tomatoes on the puff pastry, leaving a small border along all the edges. 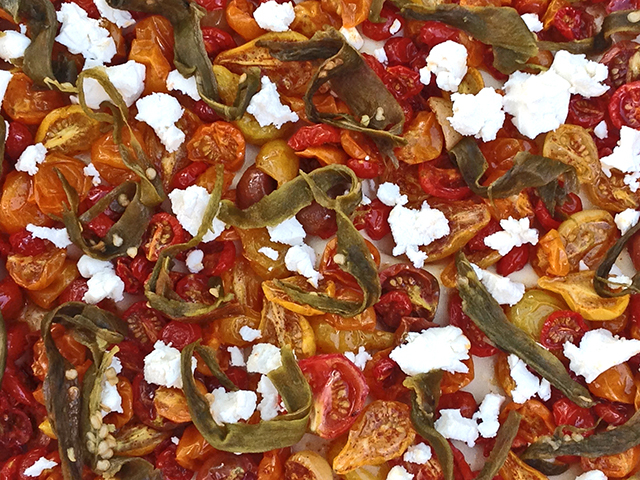 Slice the green chile into strips and add to the tomatoes then crumble the goat’s cheese on top. Place the baking tray in the oven and bake the tart for 15-20 minutes until the pastry is lightly browned and the cheese warm and melted. Slice into squares and serve hot or at room temperature.